To make things easy for you, we have designed a user-friendly system that allows you, in one simple action, to choose all 3 components of a successful ceremony : the type of wedding vows, its location and the price package. We have crafted 5 different packages to answer your needs. Budget, time dedicated to the ceremony and option services vary from one package to the other. 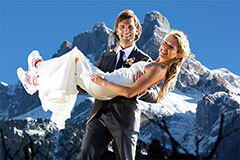 These wedding packages are all inclusive, so no risk of unpleasant billing surprises! You could wish a short or longer ceremony, a photographer and/or a video maker to set this day in stone and capture the beauty and uniqueness of it. You might also like to go for a ride in a vintage or luxury car with chauffeur, … All this is for you to choose! Anything is possible, and these packages will allow you to make sure you get just the ceremony you dream of. Whatever format you choose, you will always get our unique celebrant officiating for you. He will prepare a one-of-a-kind intimate ceremony, including a vow text written especially for the two of you (no template or copy and paste type… unlike our competitors). This first and simplest option includes the presence of our celebrant in a venue of your choice. Our officiant will write a unique ceremony text to be read for the celebration of your vows. He will also help you you choose the location. This slightly more elaborated package offers on top of the options included in the Basic package a bouquet of flower and a 1-hour photography shoot. And of course, you still get the personal writing of your ceremony text by our leading officiant. It also includes complimentary planning service. The gold package -one of the most popular we have- is a Silver package plus a photographer at your disposal for 3 hours and a romantic car tour with chauffeur. All this to be celebrated with a complimentary bottle of local champagne! Of course, our dedicated celebrant will lead you all the way to the final kiss, writing a personal tailor-made text for this special occasion. With this elegant package, you get all the advantages of the Gold package plus a film director. He will follow you throughout the whole ceremony to make sure you get stunning memories of this special day! He will also work on the postproduction to deliver an edited movie starring you and your honey. Our officiant will make sure the planning of this special event is easy as can be, and will write a personal text, suited to you only, for your ceremony. Get luxurious for this special all-day tour ! Get a photographer by your sides during the whole ceremony day, a creative film director and a Limousine with driver to chauffeur you around, sipping a glass of champagne. Our officiant will help you design this unique day, and create a one-of-a-kind ceremony text, just for you. He will be here to assist you and plan the whole ceremony with you. 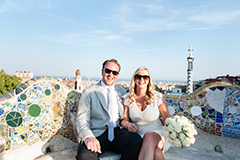 On top of these 5 packages, you also need to select the destination you would love your ceremony to be set in (the options are plenty here!). And, of course, your will need to choose the type of ceremony you would like (but your probably know this already). With over 350 marriage vows celebrated at Love Gracefully, we are qualified to guide you through the meanders of planning this special day from afar. Wether you are in for a destination wedding, a surprised proposal, a quiet elopement or a vow renewal, our officiant will pave your way to a blissful ceremony. Fluent in English, our French leading celebrant in Europe, Pierre, is a seasoned officiant. Pierre was the first to celebrate love vows in Paris, and he sure knows how to elaborate a fantastic loving ceremony!